Tag Archives: What is in a name? December 31st is a night of celebration around the world. People gather together and celebrate the passing away of the old and the coming of the new. They hope that they can learn from their mistakes of the past and improve themselves in the coming year. And, of course, they do so while attending the Holy Eucharist that night. Perhaps that last part was not accurate, but it really should be. What the world refers to as New Year’s Day the Church calls the Feast of the Holy Name of Jesus and that feast is a big one. The Feast of the Holy Name of Jesus is a Dominical Feast, or a Feast of the Lord. It commemorates the event depicted in the second chapter of St. Luke’s Gospel. The Evangelist tells us, “And when eight days were completed for the circumcision of the Child, His name was called JESUS, the name given by the angel before He was conceived in the womb.” (v. 21) Now why in the world would the Church choose to celebrate a momentous occasion like Our Lord’s circumcision on a day when everyone else is either partying or taking a nation-wide hangover day? That is simple. So, eight days after Christmas, what we commemorate on January 1, is more than just an ancient barbarous ritual of genital mutilation, as some have called it. 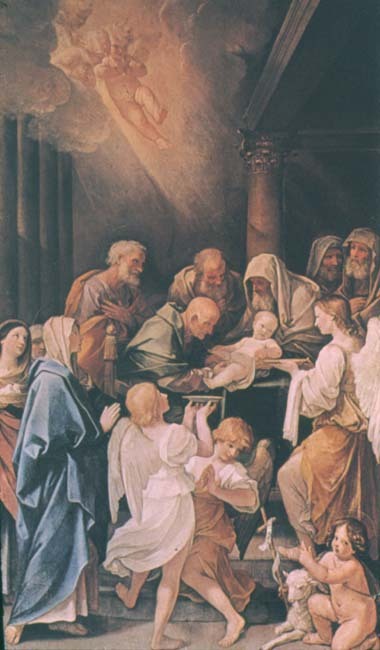 The Feast of the Holy Name of Jesus or, for the less squeamish, the Feast of the Circumcision of Jesus Christ is a feast with a two-fold purpose. In the feast we recollect our ancient heritage and we celebrate that God has a plan for each and every one of us. There is little in this world that is more inherently Jewish than circumcision. There are some scholars who believe that the Jewish ritual of circumcision, along with the Kosher dietary laws, kept the Hebrews as a distinct people group during the Babylonian Captivity. While other exiles inter-married and lost their cultural identity, the Jews were still a cohesive people group more than a full generation after their captivity began. When someone asked “why do we do this?” the Jews would reply beginning with the covenant with Abram and continuing through Isaac and Jacob, through the captivity in Egypt, the Exodus and down to Moses. It was a distinctive cultural identifier that gave them an identity amidst thousands of exiles who were rapidly losing theirs. In his Epistle to the Galatians, St. Paul tells us that circumcision is no longer necessary for the Gentiles, yet some parents still perform this ritual today. They do so, not to bind themselves under the Law of Moses, but rather to show their acknowledgement that the Christians are heirs to Abraham and Moses by faith, if not by flesh. It is a sign of our cultural heritage because Our Lord and King was a Jew and He has called us all sons and daughters. The other vital aspect of the feast has to do with the name Jesus. Shakespeare’s Juliet once quipped, “What’s in a name? That which we call a rose by any other name would smell as sweet.” (Act II, Scene ii) Such an argument may work with a teenager in love, but, Biblically speaking, it is patently false. Biblically speaking, a name defined a child. It gave them definite characteristics. A name defined who someone would be and, every now and then, the Lord would change someone’s name. These were momentous events. There is a big difference between Abram and Abraham. There is a huge difference between Jacob and Israel. There was a truly remarkable difference between a Galilean fisherman name Simon and the Apostle named Peter. Names meant and continue to mean something. We chose the names of our children very carefully. They are not all Biblical names, but they are all prophetic names. So it was with Jesus. The name “Jesus” was surprisingly common in first century Judea. It was a Greek form of the ancient Hebrew name Joshua. Two thousand years ago, the Hebrew name Joshua was more properly pronounced along the lines of Yehoshua, which means “The Lord Saves.” Jesus was also referred to as Emmanuel, meaning “The Lord with Us.” These two names, taken either on their own or together, describe exactly who Jesus is and was. Jesus is and was the Lord with us and he did and continues to save us to this day. His name was perfect, just as everything about Him was perfect. The Lord God Almighty, from before time, had a plan and Jesus, as known by that name, was a part of it. The Feast of the Holy Name of Jesus is an important day in the life of the Church. Much like the world sees it, the Church should take it as an opportunity to re-evaluate itself. Every member ought to look at who they are and who they have been called to be. I know that I have not fully lived up to my name or what God has called me to do. I wager most people would say the same. The Church is called to be different than the world. We are the “strangers in a land not our own” which were prophesied to Abram. (Genesis 15:13) We are called to be different than those around us. Maybe instead of wearing paper hats and watching crystal balls drop, we should be in Church, receiving the Most Precious Body and Blood of Our Lord Jesus Christ and hearing about the name which He received, the Name which is above all names, and how He lived up to that Name. Maybe we should be considering our own names, what God calls us, and how we might better live up to what we have been called. Tagged as Romeo and Juliet, The Circumcision of Jesus, The Feast of the Holy Name of Our Lord Jesus Christ, What is in a name?